The Finescale Gauge set is part of EFC’s family of well control instrumentation, which adds value to the choke control system of any rig. EFC High Resolution Finescale Gauges (FSG) are to designed to give instant and accurate indication of pressures on the choke and standpipe manifold. With a resolution far in excess of the traditional hydraulic or digital Casing and Standpipe gauges found in every Choke Control Panel. The cascading gauges also allow easy to view trends. As pressure rises, gauge pointers move simultaneously. 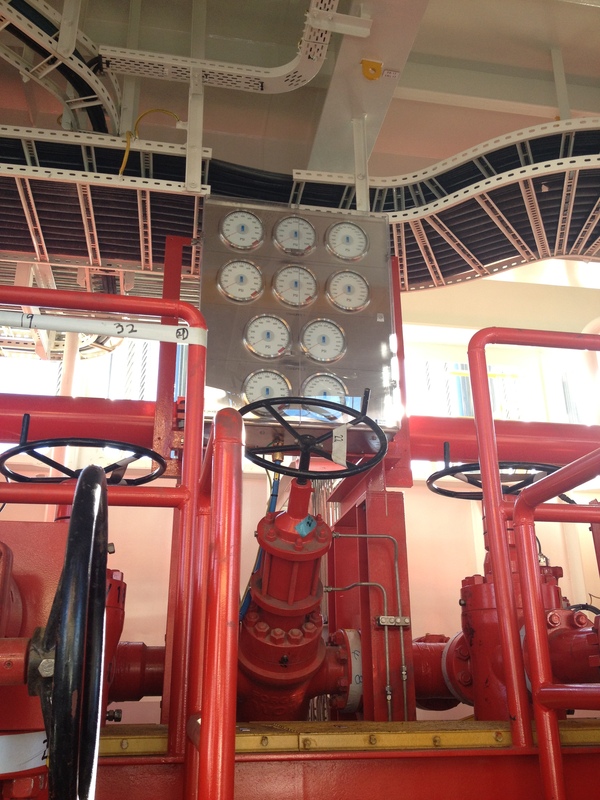 On the illustrations shown, three gauges indicate Choke & Kill, two gauges indicate Standpipe pressure. Only 3 sensors are required, one each for Choke, Kill and Standpipe. Additional ‘slave’ FSG sets can be added to display pressure on the manifolds. Displays are EFC M25 analogue gauges, intrinsically safe suitable for Zone 1 with no purging requirement. 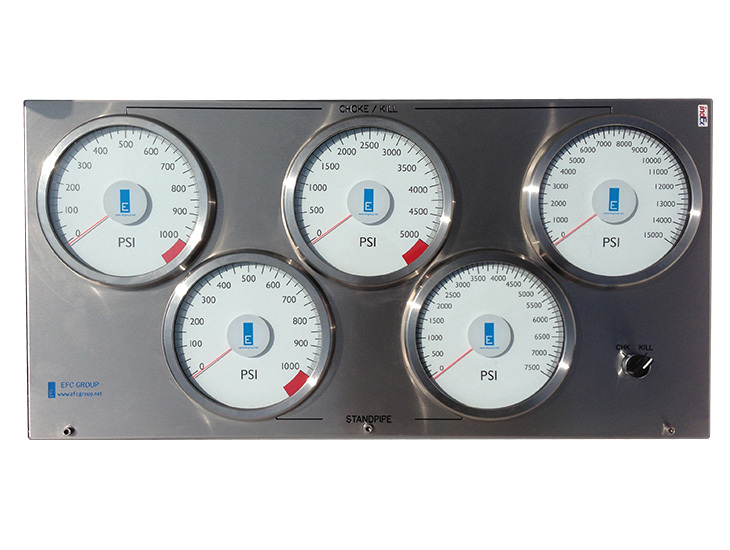 FSG’s are sets of high resolution, 8” gauges, displaying steady, accurate pressure changes in the drilling manifolds, providing vital information during critical drilling & kick-management operations. 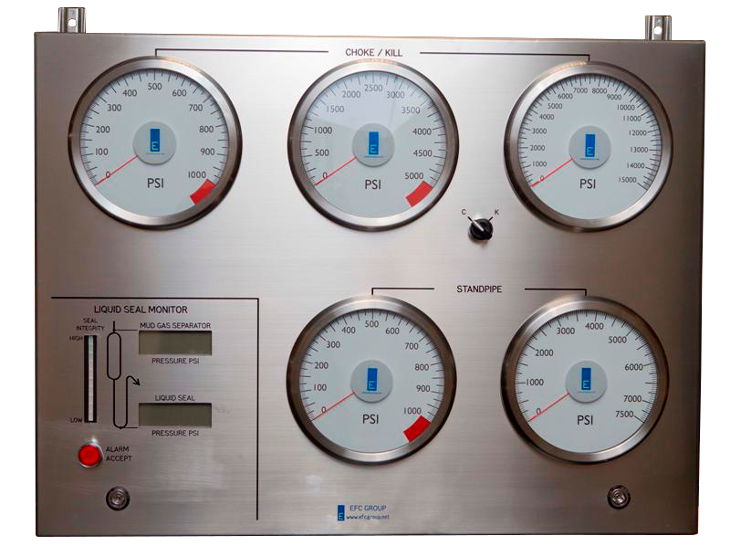 Two or three ‘cascaded’ gauges simultaneously indicate pressure. Enclosure shape and size can vary and may be tailored to suit available space. Unlike hydraulic systems, no manual isolation is required as gauge limits are reached. EFC’s electronic solution ensures no damage to gauges or sensors. Scales can be customized to client requirements and can be complemented with digital readouts.